Health Check: what should you do if you're bitten by a spider? This article is about spider bites in Australia, but doesn’t constitute medical advice. Always see a medical professional if you believe you’ve been bitten or stung by a venomous animal. I work with spiders for a living, and I’ve never been bitten by one. 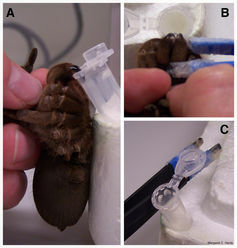 The author milking a tarantula. There are more than 45,000 species of spiders, but only a handful are potentially dangerous to humans. Only two spiders in Australia are of medical concern: funnel-web spiders (in the family Hexathelidae) and redback spiders (Latrodectus, in the family Theridiidae). A review of 130 confirmed white-tail spider bites showed no cases of flesh-eating ulcers or confirmed infections, so those spiders are not considered dangerous to humans. Most “spider bites” that doctors see are actually skin and soft tissue infections. The myth that spider bites cause secondary infection has also been busted, although – as for any wound – disinfecting and cleaning is necessary. In the course of your life you’ll see many spiders (and there are many more you won’t see), but only if they feel threatened will they bite you. Generally a spider tries to warn you, but unfortunately you might not always see (or hear) the spider. Please, do not do this to your pet tarantula. Most spiders don’t want to bite you. Venoms are energetically expensive for the animal to make, and the spider doesn’t want to waste venom if it’s not needed for defence or to catch its food. Funnel-web spider venom is one of the few that is lethal to humans (and other primates). It’s deadly because of a single component (δ‑hexatoxin‑Hv1a) out of the hundreds of different molecules in the venom. The three-dimensional structure of the vertebrate-active toxin from funnel-web spider venom. 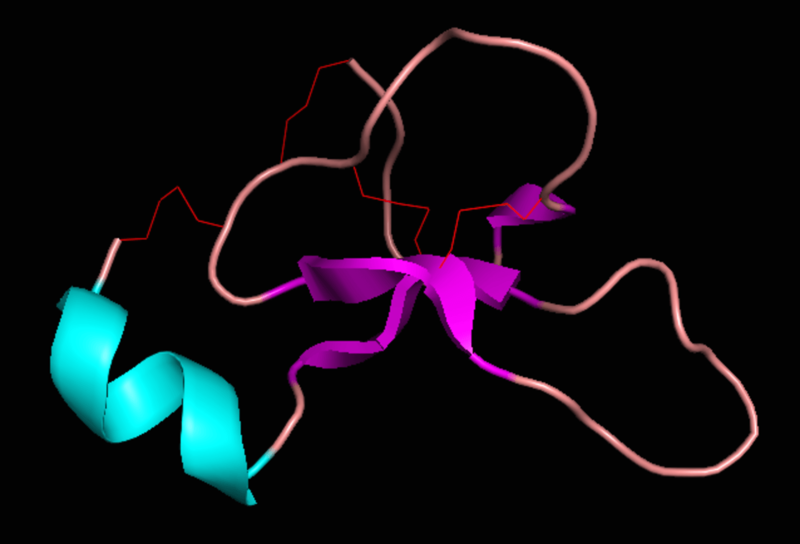 The red lines indicate the molecular bonds that confer extreme stability to the peptide. Redback spiders are the most commonly encountered spider of medical concern, but less than 20% of all bites cause significant medical symptoms. While unpleasant, the symptoms (which may include muscle pain, vomiting and sweating within 12 to 24 hours) are generally not lethal. Bites from funnel-web spiders are also rare and, again, the amount of venom injected is not always enough to cause significant medical symptoms. After the antivenom was created in the early 1980s, recovery from nonfatal bites changed from several weeks to one to three days, and no one has died since. Symptoms of exposure to a lethal dose of funnel-web spider venom include tingling around the lips, tongue twitching, salivation and muscle spasms, which may lead to convulsions. Subsequent high blood pressure, rapid heartbeat and respiratory distress are why the venom is potentially lethal. When a funnel-web injects a lethal amount of venom, without the antivenom, death can occur within an hour. Tarantulas can climb glass and plastic; funnel-web spiders cannot. Funnel-web spiders have a classic strike pose to threaten off predators, in which they rear up on their back legs. The author, milking a funnel-web spider. This spider is being handled by an expert for research purposes; do not try this at home. Despite the distinctive look of a funnel-web spider, a number of spiders look similar. Male and female funnel-web spiders are large (on average body length of one to five centimetres), with a brown or black body. The front of the body is glossy and may be covered in some dark hairs; the spinnerets at the back of the abdomen are easily visible. All these spiders are potentially dangerous, but only two are funnel-web spiders. 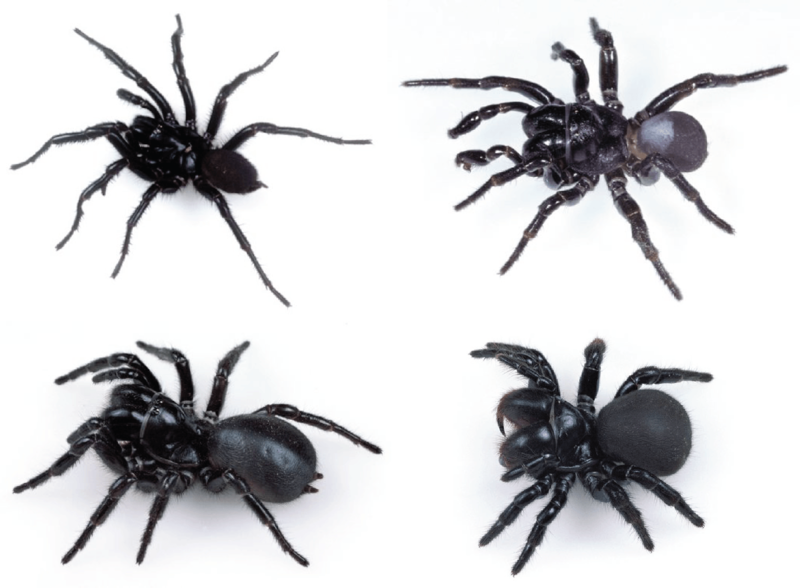 Clockwise from top left: male Sydney funnel-web spider (Atrax robustus); male mouse spider (Missulena bradleyi); female mouse spider (Missulena spp), and female Blue Mountains funnel-web spider (Hadronyche versuta). Photos from the Australian Museum. Redback spiders are small (1cm for females, 0.4cm for males), and are black or sometimes brownish in colour. Females have an obvious orange or red stripe (which may be vaguely hourglass) on the underside of the abdomen. Males have similar, but less distinct, markings. If a spider bites you, keep a cool head. Treat each bite as though it could be deadly, since it takes an expert to tell a funnel-web spider from any of the other large, black spiders found in Australia. See a medical professional immediately if you think you may have been bitten. For funnel-web and mouse spider bites, experts recommend using a pressure-immobilisation bandage before seeking medical help, to slow the progress of venom into your circulatory system and around the body. Proceed immediately to a medical professional who can monitor your symptoms and determine whether the antivenom is required (most hospitals stock it). There is no proven first aid treatment for redback spider bites. However, according to Associate Professor Julian White, a clinical spider bite expert at the Women’s and Children’s Hospital in North Adelaide, the immobilisation method is not appropriate for redback spider bites. You should go immediately to a medical professional who can monitor your symptoms and determine whether the antivenom is necessary. Step 2: What bit you? If it’s safe to, collect the spider. If you don’t want to collect it, try to get a clear photo of the spider’s face, and another of its body from above; try to realistically remember the size of the spider. Not all spiders live everywhere, so an expert is needed to identify which spider you’ve encountered. Occurrence record map of funnel-webs (left, spiders from the family Hexathelidae) and redbacks (right, spiders in the genus Latrodectus). Maps from the Atlas of Living Australia. Once experts identify which spider is responsible for the bite, doctors can determine what treatment is needed. Spider venoms are complex chemical cocktails consisting of hundreds of different components. Each component has a unique role to play in the venom, and the activity of each individual component is very specific. The individual components in spider venoms that are responsible for most of the activity are small proteins, or peptides, that contain a specific, highly structured three-dimensional scaffolding. We call those structured peptides toxins. Antivenom is designed to neutralise the individual venom components that are dangerous. The antivenom consists of purified immunoglobulins, which bind the venom toxins while they circulate in your blood. Because the antivenom is designed to bind the toxins, not to treat by age or weight, the amount administered will be the same regardless of the size or age of the patient. Try to avoid being bitten in the first place. In the case of redbacks, learn to recognise and avoid their distinct webs. This video outlines the finer points of redback spider web design. In the case of funnel-web spiders, be alert during their mating season (November to February) when males are likely to be out of their burrows. Their burrows also have a distinctive web, and generally you’ll be able to detect a funnel shape in the above-ground part of the web. A funnel-web spider burrow on Fraser Island. If you are planning a trip and are concerned you’ll be in the same environment as these beautiful and rare animals, consider completing a first aid course for remote situations. For more information about spider bites and clinical toxicology, visit www.toxinology.com.